The Rockhopper Expert 29 2019 is the perfect bike to begin your dive into the XC world. That's because Specialized built it to be light, durable, and exceedingly capable. It starts with the new A1 SL Alloy frame that features Boost™ QR 141 spacing, internal cable routing, and optimized tube shapes that save weight and give clean lines to the frame. Lastly, our Sport XC 29 geometry adjusts the reach, angles, and standover height to make for an improved fit across the size range. This is sure to keep you ripping and confident while heading both up and down the trail. This Rockhopper comes spec'd with a mix of durable Shimano components, powerful Shimano hydraulic disc brakes, a grippy Ground Control front tyre and Fast Trak at the rear, and an SR Suntour XCR-Air fork with just the right amount of travel. The frame is constructed from lightweight A1 SL aluminium in order to provide a compliant, durable platform to support our acclaimed XC Sport 29 Geometry. Combined, you get a bike that's more than efficient on climbs and descends just as well. 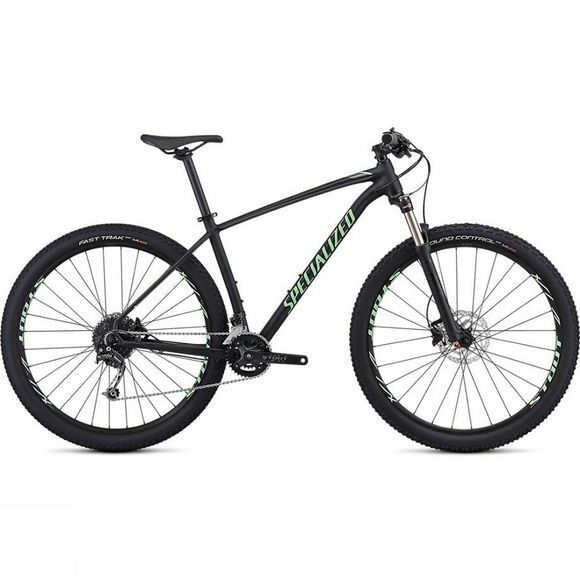 Front Tyre–Ground Control Sport, 29x2.3"
Rear Tyre–Fast Trak Sport, 29x2.1"
We have a wide range of mountain bikes available for all levels from a vast range of different brands. Ensure your bike is kitted out for your next adventure.